Klay Thompson in Game 6. Via AP. 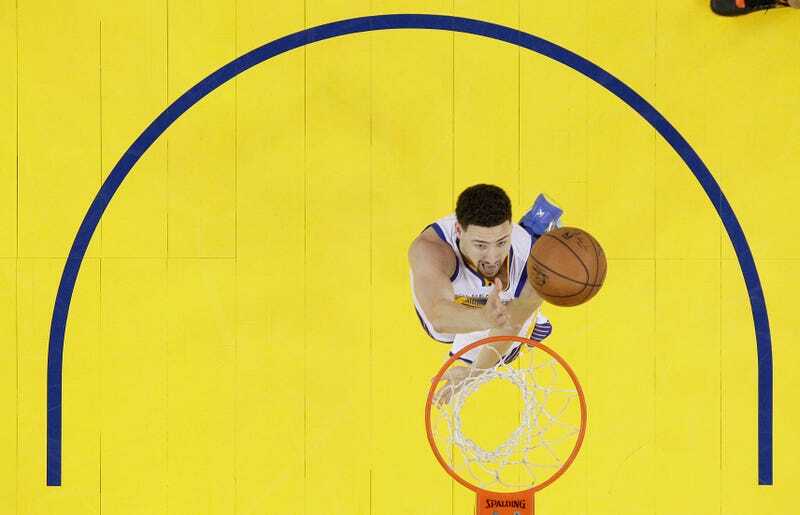 Presumably a couple of goatherds in the Eurasian Steppe and perhaps deep-water oil platform welders in the North Sea are still unaware, so let’s start with the obvious: Klay Thompson had himself a night Saturday. The other Golden State guard took over the elimination Game 6 for the Warriors to such a degree that Steph Curry, one assist shy of a 31-point triple-double, looked like a klutz in comparison. Thompson’s line on the night included an NBA playoff record 11 three-pointers made (on a relatively austere 18 attempts), every last one of which the Warriors needed to push the Thunder to a Game 7. This was not a record won by sport-shelling an overwhelmed opponent; Thompson carried the Golden State offense through periods of relative disarray, and kept throwing darts when his teammates managed to coalesce. His first trey put the Warriors on the board 75 seconds into the game, and his last put Warriors ahead for good with 1:35 to go. For an instant there after that last one, he even showed an emotion. If you were on Twitter during this assault, you know it collectively rolled onto its back and peed into the air. Thompson hit those 11 treys on a night when the rest of the Warriors combined for 10 and the Thunder made only 3 of 23 from deep. The Thunder, though, led most of the game because they were hell in close, dominating the points in the paint 52 to 28 and allowing the Warriors to hit only 15 shots inside the arc (where Thompson shot just 3-for-12). Oklahoma City’s defense hounded the Warriors’ shooters deep, too, and with the Golden State bigs roaming to set screen after screen, the Warriors offensive sets would take on arrangements bizarre for an NBA game, with one, maybe two players of either team within 22 feet of the basket. Thompson’s uncanny talent on display in Game 6 was his ability to dance to a clear spot just beyond the arc, catch, and shoot in a motion so quick it qualifies as a flinch. “All Klay needs is a sliver of daylight,” Curry says in what might be the best trey-by-trey breakdown of the game, Rob Mahoney’s over at SI.com. I’m hand-counting on this, but I’m pretty sure the math is right: The dude took two dribbles total on those 11 made threes. When Curry goes on that sort of binge, he tends to waterbug around both with the ball and without. Thompson’s more launchpad than ball-handler, and when he’s shooting as he did on Saturday, he’s just the punctuation on the rest of the Warriors offense. His catch-and-fire routine, when it’s this efficient, resembles alley-oops that end from 23 feet away instead of at the rim. With his 10th trey, Thompson broke a five-way tie for the NBA playoff record; the 11th, so crucial, just gave him clearance. The guys who’d previously hit nine in a game—Dallas’ Jason Terry 9-for-10 in a 36-point blowout against the Lakers, Boston’s Ray Allen during a 51-point binge in a loss to the Bulls in 3 OTs, Allen earlier nailing 9-of-13 in a Milwaukee win over Philly, Vince Carter shooting 9-of-13 from deep on the way to 50 over Philly, Rex Chapman going 9-of-17 in a Suns win over the Sonics—all had better shooting nights, arguably. But no one has put on a display quite like Thompson’s in a season-saving squeaker before. He rescued a 73-win season from the damn garbage and suddenly that sucker is looking good as new.